Technology is great!...until it isn't. Case in point- the other day when my brand new computer could not for it's life run Pandora, Photoshop, and the 5 billion internet tabs I had opened. Which I did indeed need all of! How is one supposed to work in those sort of conditions- those non-existant conditions?! I mean, really? No music?!? No constant self-shuffling playlists of amazing tunes for my ear canals? I need music for my sanity! I need Photoshop for my...photo editing sanity! I also needed all of those tabs open....for my...well...sanity! On most days, not a problem! I can switch between researching, defining, gazing, interpreting, writing, editing, listening, etc all with a few quick clicks. But that day! That horrid day! I had to wait....like minutes for things to happen. Sheesh. I should have titled this post, "Selfish Christina's Ridiculous First World Problems: An In Depth Study". Good news friends! Today- totally back to normal. Phew. Things could have really gone from bad to worse there. So glad they didn't. 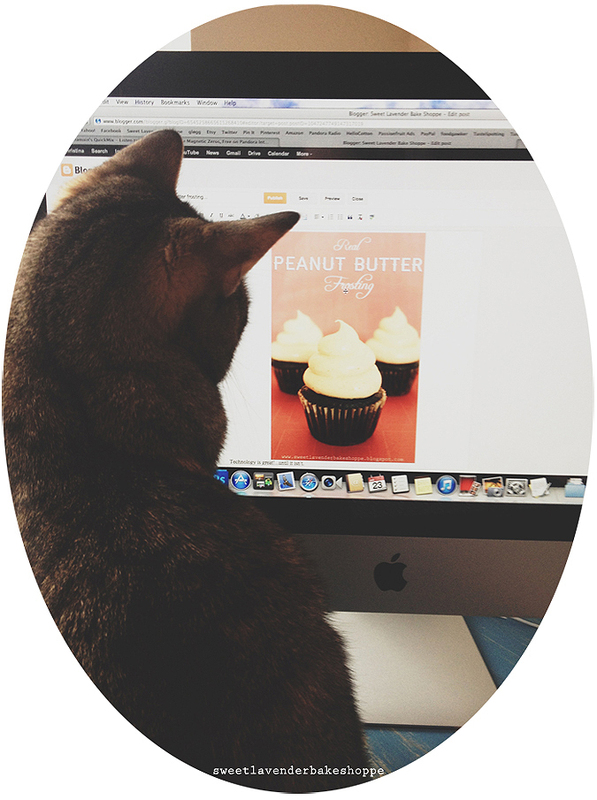 Now lets talk peanut butter. And frosting. I don't usually opt for peanut butter frosting, but when I do I choose homemade peanut butter frosting made from the yummiest peanut butter in all the land. I apologize for that sentence...I sort of decided to stay on the "dramatic emphasis" train. Moving on. This peanut butter is silky smooth, light as air, and packed with real peanut flavor. Almost reminds me of the flavor of a "Big Hunk" candy bar! Which I actually love. Using natural peanut butter creates a flavor incomparable to that of the unnatural stuff, as well as gives the buttercream a neat speckled look. Love those peanut speckles! Just make sure you drain that oil that accumulates on top, very very well- we do not need all that extra moisture. If you store your peanut butter in the fridge, make sure to bring to room temperature before using. My co-worker, whether I like it or not. Over a pot of gentle simmering water, create a double boiler with stand-mixer bowl. Whisk egg whites and sugar into that mixing bowl. Continually whisk over simmering water until sugar dissolves and you are unable to feel any sugar granules when rubbed between fingertips, about 5 minutes. Careful not to cook egg. Remove from heat and beat egg whites (with whisk attachment) in mixer until egg whites form stiff peaks and are completely cool (as well as mixer bowl), about 15 minutes. One square at a time, add butter while mixer is continually whisking the meringue. Continue to do this until all butter is incorporated. You want your buttercream to be light and fluffy here. If it's not, and looks broken (butter too warm) all you need to do is continue whipping with cold packs or ice under your bowl. As soon as that butter starts to firm up from the cold, your buttercream will whip back into shape. Literally. Add vanilla extract and 1/4 vanilla bean's seeds. Drain oil on top of room temperature natural peanut butter and then stir REALLY WELL before using. Mix in gradually, making sure to scrape down sides as you go. Refrigerate 20-25 minutes before using to set up. *If using that day keep room temp with plastic wrap on top. 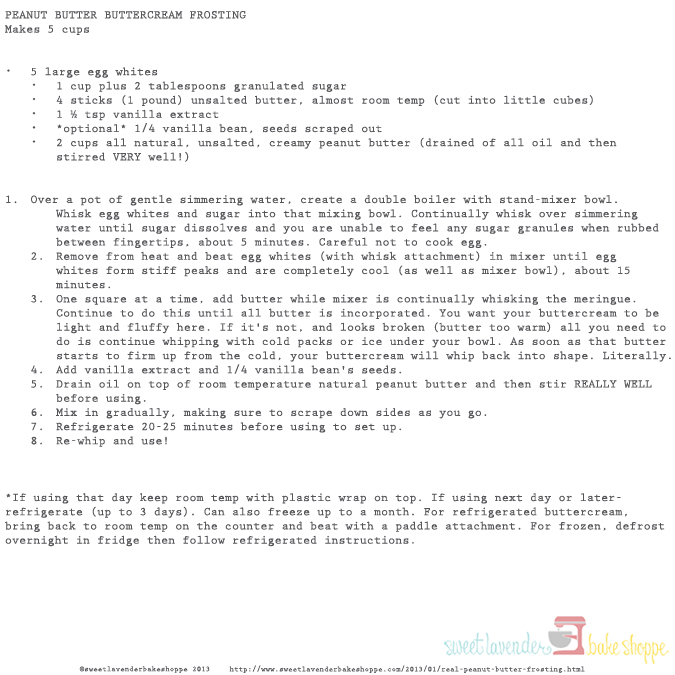 If using next day or later- refrigerate (up to 3 days). Can also freeze up to a month. For refrigerated buttercream, bring back to room temp on the counter and beat with a paddle attachment. For frozen, defrost overnight in fridge then follow refrigerated instructions. 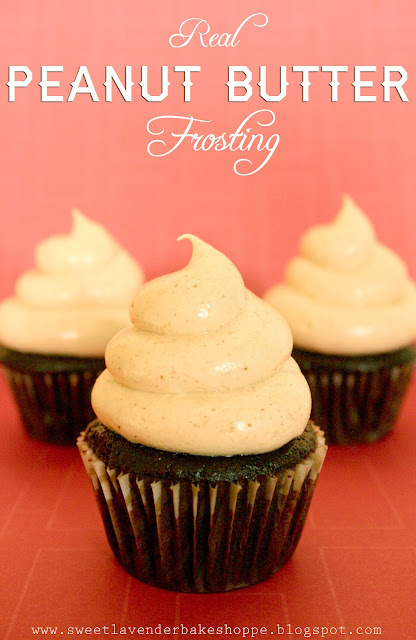 I adore peanut butter frosting!!! I wonder if I made it, if it would even end up on the cake? Yum Yum and some more yum!